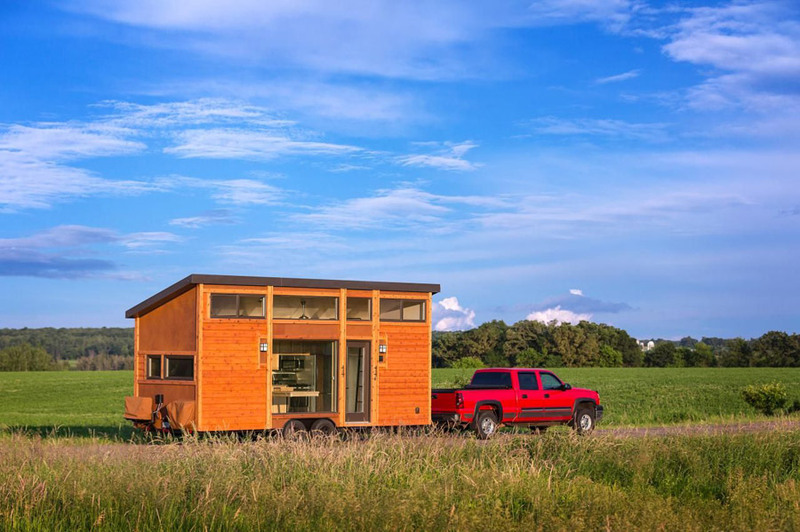 A tiny home designed to hit the road that comes in two sizes, 24′ (180 square feet) and 30′ (255 square feet). 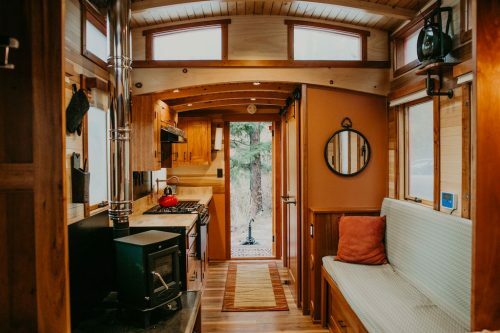 Designed and built by Escape Traveler. I am confused – the 3rd picture shows a completely different “living room” with another sofa and sliding door that cannot be found on the other pictures. Is it another version? Or is it just a wrongly inserted picture? Thanks. Wow! This is the difference that having professional design makes. Gorgeous, gorgeous, gorgeous! 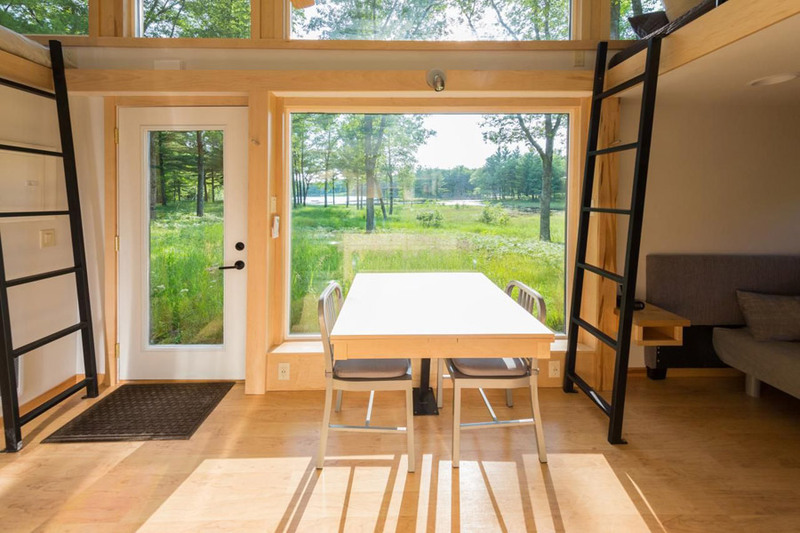 When I found out the same team did a brilliant 400 square foot vacation cabin I have long admired, I was not surprised at all. Brilliantly done, and worth every penny of the $72,000 price tag. You sound like a shill. It’s pretty. Not sure it’s worth 72K. This model is actually $65k. He was talking about the XL version of this which is $72k and can be viewed on their website. They still sound like a shill. It’s still pretty. Still not sure it’s worth 65K. Its worth whatever someone is willing to pay for it. You seem to think that worth is only cost of materials. Yes you can build a tool shed for far less, so what. This is a custom turn key design. You get what you pay for. 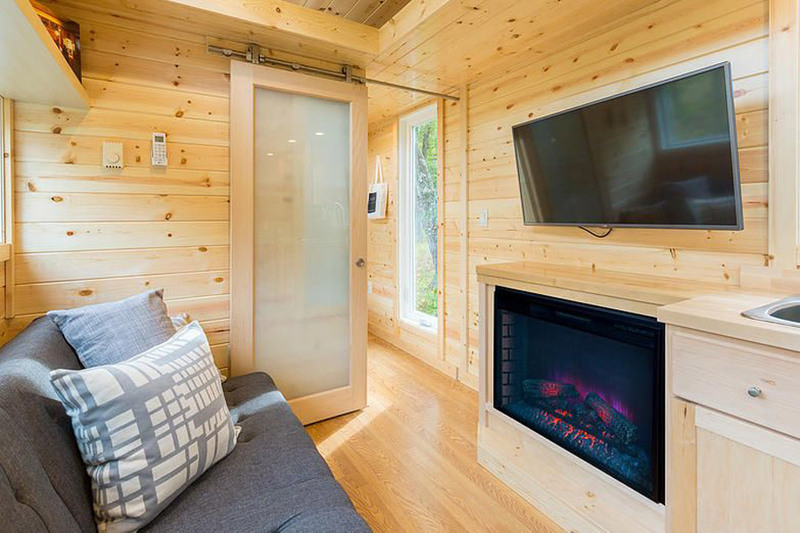 For the record I’m not a shill, just a designer who has just finished building my own tiny house. I know how difficult it is to accomplish something like this. 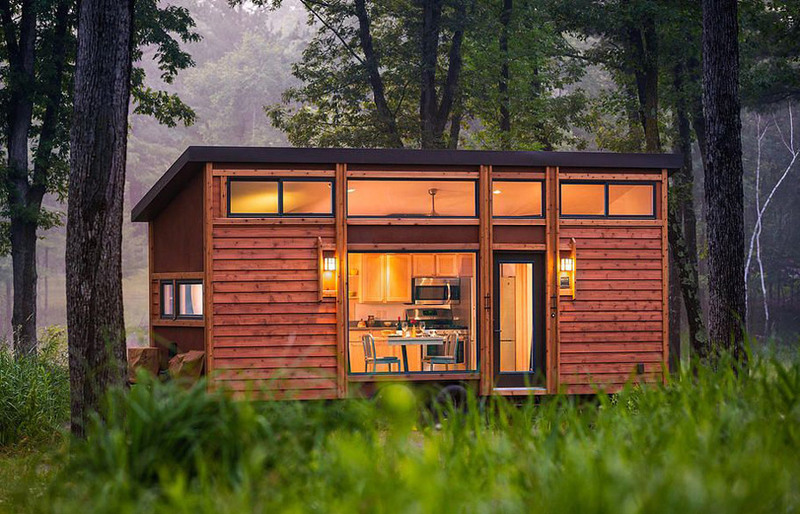 How many tiny houses have you designed and built? 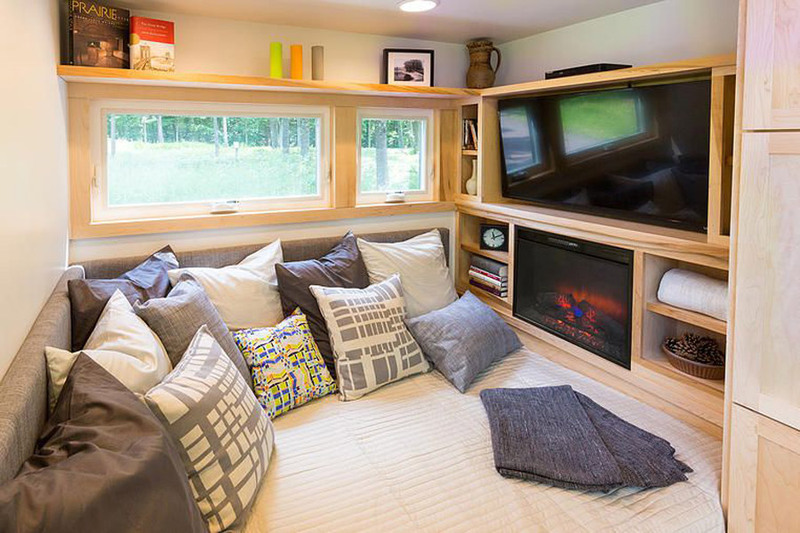 I am a HUGE fan of the sleeping nook!! 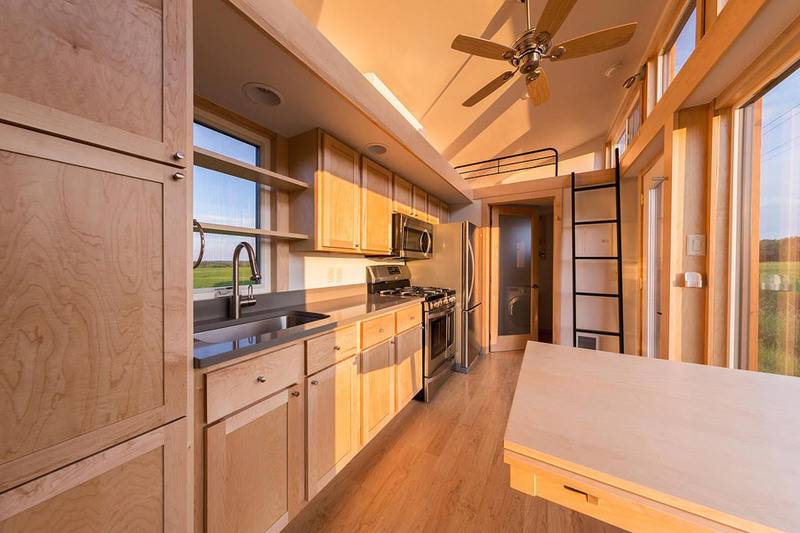 Plus the kitchen has the range AND the oven AND a full size fridge AND what looks like tons of storage space…. the bathroom has a washer/dryer….. if the closet space is as good as the kitchen space, I am totally in love!!! This is absolutely GORGEOUS! If I had the money, I’d probably buy this, but I would insist on having stairs to the loft put in. I’m turning 57 years old this week and I can see myself having a bad accident on that ladder in the middle of the night when having to go to the bathroom. Other than that, it’s very light, airy and spacious, not to mention warm and welcoming! 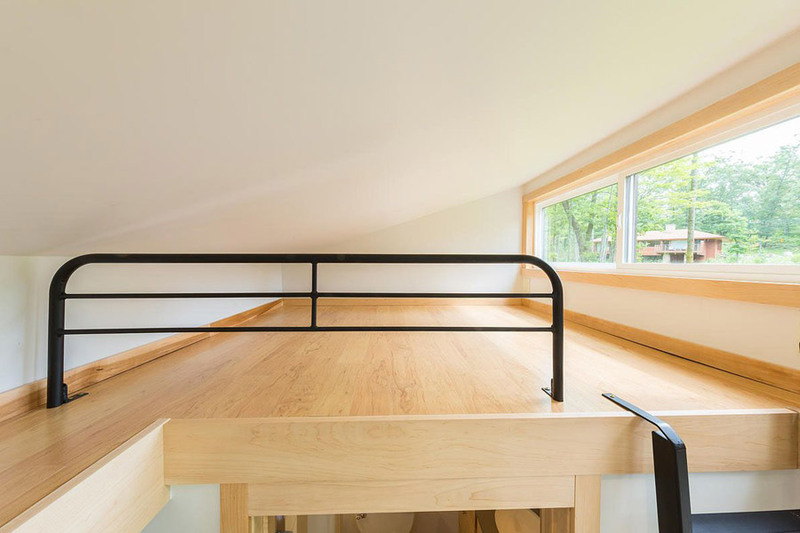 I suspect I’d open up the couch and sleep there rather than climb ladders to the lofts. Of course the XL has a downstairs bed! Other than the ladders it’s pretty much perfect. I do love the massive amount of windows. Absolutely wonderfull design,no wonder the price tag.Cabinetry is very nice ,a lot of money in the appliances . 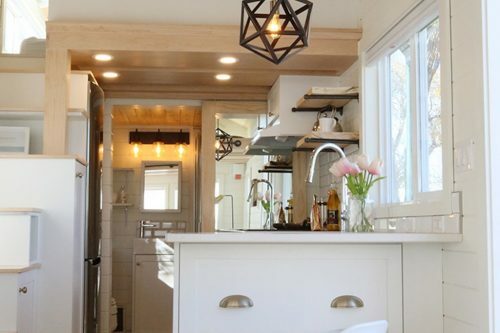 Under counter sink,faucets,etc.And the finishing is first class.Build this in BC the cost would be more.You cannot buy a mobile home here for less than 12,000.And the quality is not comparable,to this.Mind you the flat screen TV added a big chunk of change ,plus the fire places. I,m up to 30 thou building one.But a labour of love. 300 sq ft. Nice job. A really nice design for sure. I’m no engineer, but I sure look at stuff like one. That was mostly a joke, but anyway, i noticed on the picture with the trailer being pulled behind the truck that the axles seem very far forward for proper tongue weight and anti-sway balance. 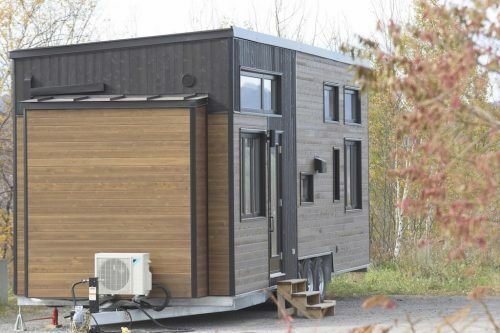 I’m sure they have tested it but just something I noticed since it is promoted on this site as a travel-able tiny house. Great execution. 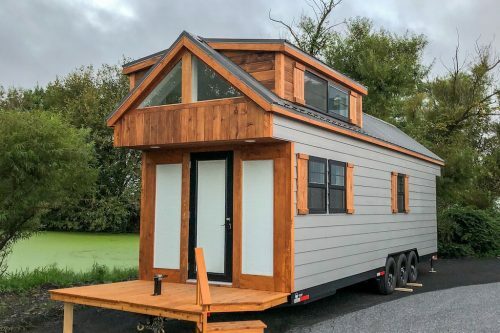 Very nice as a tiny home, but certainly not a travel trailer as the company bills it- 12,000 lbs and a 13′ tall sail, try coming across the plains with that or down the Big Sur coast highway, yea not. 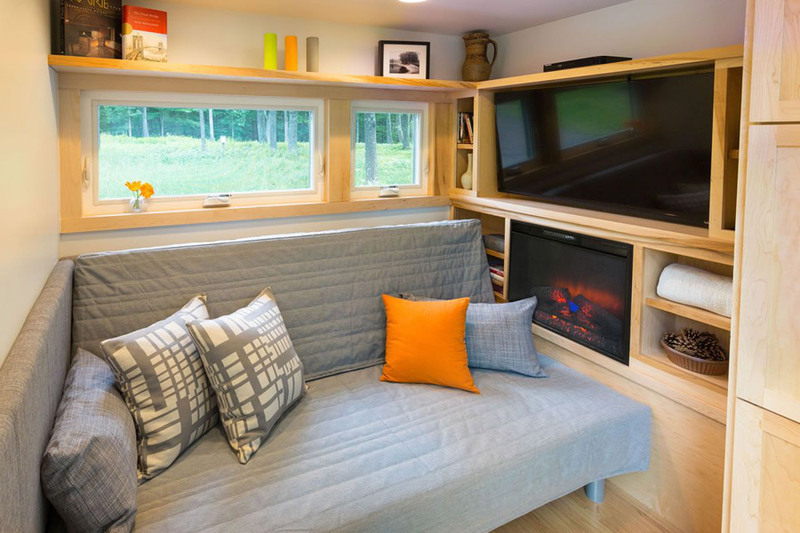 Buy an Airstream to travel, buy this for a lovely tiny home, very well designed indeed.